Several times over the past few weeks, I’ve been talking to parents about how they can use visual support to help their children’s communication. 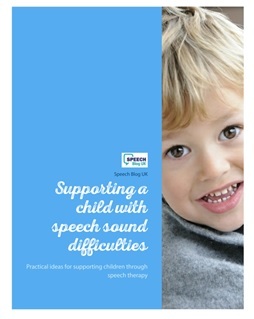 This is one of those things that speech and language therapists bang on about all the time (!) but I don’t know how much sense we make to other people sometimes. So today I’m going to try to explain what we mean by this, why it can be helpful, and hopefully give a few practical ideas of how you can use visuals in everyday life without needing to carry a filing cabinet full of pictures with you everywhere! Whoever you are and whatever you’re learning, it’s helpful to try and use your strengths to help your weaknesses. For example, my spatial awareness is pretty much non-existent. I could get lost on a postage stamp! Maps don’t always help me, and I am really thankful for the invention of the satnav which tells me, in words, where I need to go! Before that, if someone said to me “I’ll draw you a map” I would always ask them to write me a list of clear instructions instead; I would still get lost, but I would find it easier to follow! I also always tried to give myself extra time to get everywhere, even if I had been there lots of times before! My dad lived in his last house for more than 15 years and I still went wrong at least once every single time I went there until I got my satnav!! My point is, that I have developed strategies which use my stronger verbal skills to help me with things I can’t do. 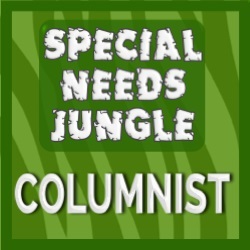 By the same principle, I try to find out what the children I work with are good at so that we can use that to help them. Often (though of course not always), children with language difficulties are good at the sorts of visual and spatial things that I’m not – jigsaws, remembering the way to places, remembering faces etc. so it makes sense to try and use these things to help them. Children with social skills difficulties – visual support can help put some structure into social situations and therefore make sense of them better. 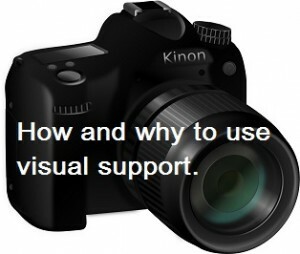 What sorts of visual supports are there? There are many and varied visual supports that you can use to help a child. These range from visual timetables and social stories to signs and gestures to word maps to help children recall and use new words. Follow the links to find out more about each of these specific strategies. Anything you can see can be used as a visual strategy however – pictures, colours, demonstrating things for children, looking at the situation around… Be creative and start thinking about using visual methods to teach your child and you’ll find visuals all around you. How can I use visual strategies in everyday life? If you’re having a day out, take a few photos through the day. At the end of the day look through them one at a time and ask your child to say a sentence or two about each one to tell someone about their day. If you’re trying to talk to your child about somewhere they are going later or another day, look at pictures on the website on the computer or on your phone while out and about to help them understand and talk about what you are going to do. If you come across new vocabulary, take a photo where possible. Eg if your child has just come across a cactus for the first time and learnt the word, take a photo of it to look back at with them later and help them to remember the word. Use signs and gestures – your hands are always with you! Draw! It really doesn’t need to be a masterpiece – a few stick people are more than adequate. Encourage your child to look around for clues – what are people doing? Where are they going? How do you use quick and easy visuals with your child or the children you work with? I draw – I’m not good at it – I have had 5 year olds I work with laughing at my pictures, but we get there! I also think it’s a nice way to show them that not everyone is good at everything too – knowing we all have things that are tricky helps their confidence in sessions too. I frequently have children laughing at my drawings too! I totally agree about showing children that we all have things we find difficult – really important for self-esteem. I too have kids laugh at my drawings! I love to use visuals with all of my students. I think they are really helpful to gen ed teachers too.